Last week we presented Part 1 of our Lighthouse Tour, heading south from Brewster House B&B in Freeport, Maine, and visiting Portland Head Lighthouse and Cape Elizabeth Light (Two Lights), as well as Cape Neddick Light (The Nubble). This time we’ll turn to the north and take US-1 an hour or so north to Rockland, where you can optionally visit the Maine Lighthouse Museum. You can also go just a bit farther on US-1, to Camden, to enjoy the beautiful harbor town. 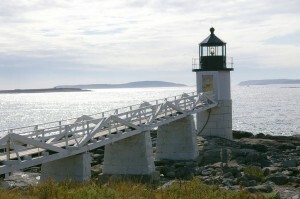 From Rockland, we’ll turn south, toward Owls Head, and visit Owls Head Lighthouse. 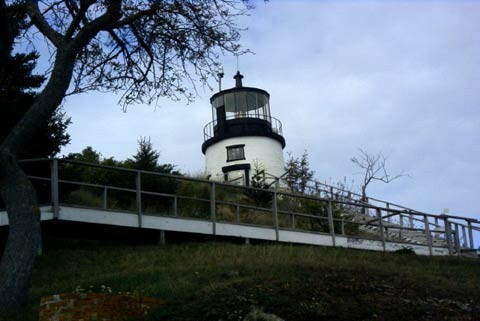 The lighthouse, standing atop a small hill, but steep enough to require stairs to the top, overlooks Rockland Harbor and Penobscot Bay, providing magnificent views. The lighthouse was lighted in 1825 to help guide mariners safely into Rockland Harbor. Leaving Owls Head, you may want to stop for a tour of the wonderful Owls Head Transportation Museum, with its antique automobiles, as well as old aeroplanes (all still in working order!) and more. 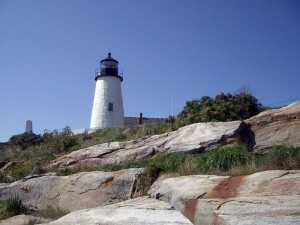 Driving down the peninsula past Spruce Harbor and St. George, there are other lighthouses we can not see – Two Bush Island Light, Tenants Harbor Light, and Whitehead Light – all of which can only be seen from the water (or by air). Next we turn toward Port Clyde and Marshall Point Lighthouse. Be sure to visit the Port Clyde General Store, and view the harbor from their picnic tables (perhaps while eating lunch). Marshall Point Lighthouse, marking the entrance to Port Clyde Harbor, was first built in 1832, then rebuilt as it currently stands in 1857. The beautiful setting is popular with photographers, who gather at the site early, awaiting a spectacular sunset opportunity. Returning to the north, we come to Thomaston, a lovely town with restored Victorian homes, shady trees, and a quaint downtown. Proceeding south on US-1, you’ll pass Moody’s Diner, where you can get almost anything, from a grilled cheese sandwich to a lobster dinner, and their blueberry pie (or ‘most any other you like) is always worth stopping for! 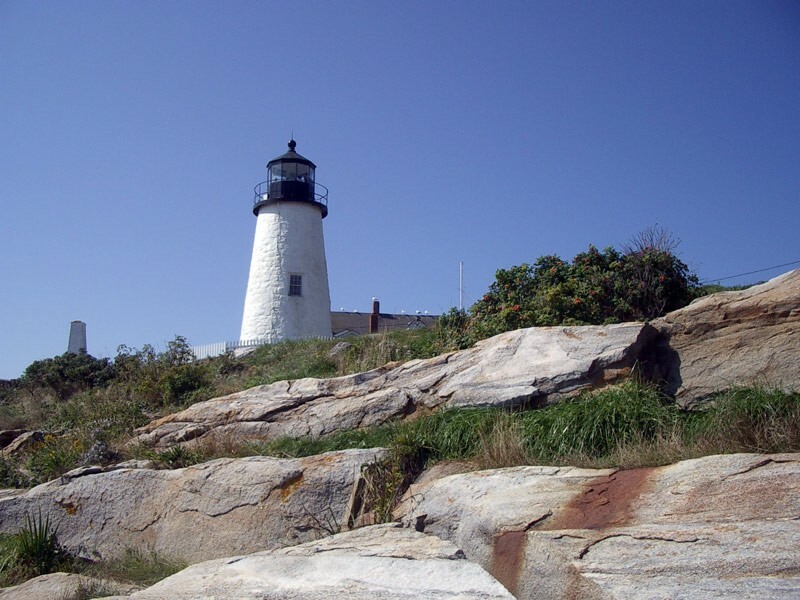 At Damariscotta we’ll turn off US-1, pass through the pretty village, and follow Route 130 to the end, where we’ll visit Pemaquid Point Lighthouse. First built and lighted in 1827, the structure wasn’t sound, and was replaced in 1835. There is a magnificent view from the bluff where the lighthouse stands, and you can easily walk down the rocks to view the lighthouse from below. When volunteers are present you can go up in the tower, and there is a museum in the Keeper’s house. Returning to Damariscotta and US-1, we can take the turnoff for Route 27 toward Boothbay Harbor, then turn toward West Boothbay and Newagen, where, near the end of Southport Island, we can see The Cuckolds Light. This lighthouse is not well known, and dates from 1892, when it was erected to prevent vessels from running aground on the ledges nearby. We’ll return after a visit to Boothbay Harbor (and maybe an ice cream cone), taking US-1 south to Brewster House. 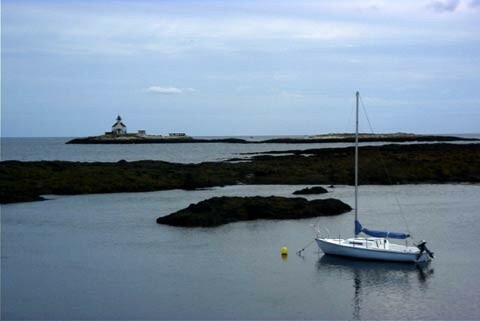 Get all the information on our Lighthouse Tour on our specials page.